The New Year offers the promise of a new start, a blank slate, and a fresh hope that MAYBE we’ll “get it right” this year. Since 99% of us will abandon those resolutions before Valentine’s Day, perhaps your strategy for self-improvement could stand a new approach. Self-acceptance is not rationalization, where you lie to yourself that your behavior is OK. Self-acceptance is the willingness to look at the truth and acknowledge it. It takes ongoing self-awareness to notice when the time is ripe for positive change, and when the way is blocked. Your Feldenkrais classes can be the foundation for new self-awareness, from the inside out. 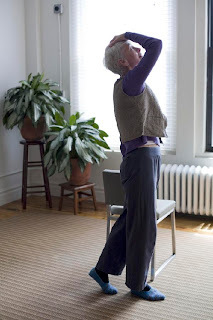 Feldenkrais classes “upgrade” the connection and communication between your brain and your body, using movement — the native language of your entire nervous system. You’ll be amazed at what can change.